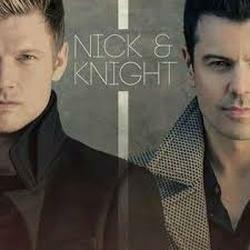 Pop music fans might be excited to hear about the new album released on September 2nd, Nick & Knight, featuring former boy band members, Nick Carter and Jordan Knight. Nick Carter used to be one of five members of The Backstreet Boys back in the mid- 1990’s until 2001 when the band decided to take a break. Nick opted for a solo career for the next four years until the group reunited and toured with New Kidz on the Block in 2011. Interestingly enough, Jordan Knight was a member of New Kidz on the Block, another boy band who had a similar history and style to the Backstreet Boys. New Kidz on the Block split up prior to 2000, leaving Jordan to pursue a solo career for the next couple of years until they got back together for one more tour. These two boy bands were so similar in their musical and performance style that it was not surprising that a collaboration between two members occurred. A quick glance at the album doesn’t reveal much about the music or even the artists themselves. The cover is a very serious photograph of the two artists standing side by side, suggesting that the whole vibe of the music on the album will be solemn or deep, however, it is almost the opposite. The album cover and the overall composition of the music provided did not match, though they should. It would have been more fitting on the cover if Nick and Jordan were smiling and wearing clothes that were more casual rather than dark business-like jackets, therefore presenting an uplifting mood to represent the vibes of the songs. All of the tracks on the album have a fast tempo and electronically dubbed beats so they bring about energy and an uplifting mood, which did not relate to the cover. The titles of the songs also did not bring any creativity or thought to them, although, there are only ten. Usually, solo artists cover up to twenty songs, so its not too much to ask from listeners that are paying over ten dollars for an album featuring two artists to come up with more than forty minutes of music. You could go to the store and buy Katy Perry’s 2013 Pop album, “Prism”, and listen to six more songs; that’s over half of Nick and Knights entire album. Also, the titles themselves seem as if they chose the most frequently sung word in the song for the title because they were too lazy to think of something better. For instance, the song “Paper” where they repeat the word eleven times could have been called “ We Don’t Have to Worry” since the song revolved around a relationship with a girl and how they don’t worry about money or anything because they have each other. This brings up another issue, which is the lyrics and overall direction of the album. Much like every other boy band album out there, Nick & Knight consists of ten songs, all about girls, love, and relationships. There is no problem with this except that its been done already by so many other artists, including their younger selves. The two could have really created a more diverse album by writing lyrics about their experiences in music, their marriage life, family life, or significant occurrences they had in the past. Nick Carter and Jordan Knight should have went in a different direction to expand their musical capabilities and draw in more of an audience by singing about something bigger than just having a crush on a girl. Being that they are both married men, I feel that their lyrics didn’t seem to be personal but more of a song that someone had wrote for them. I know that Carter has dappled into the lyric writing business with a total of three songs written completely by himself and that Jordan Knight has written a handful on his own. With that being said, they should’ve made the album more personal by adding more input into the words and meanings of the songs. Also, I got the sense from these lyrics that either they or their producers didn’t know what to write or just didn’t put any effort into the lyrics of the songs at all. A good portion of the songs consist of lyrics such as, “ uh uh uh, oh it will never be this good, uh, uh, oh, no one else could love you like, uh, uh, uh, oh, it will never be this good” showing that they used a lot of space with just fillers like “uh” and “oh” as well as very repetitive verses. For example, in “Just the Two of Us”, Nick and Jordan repeat “two of us” in every verse of the song giving the impression that no thought or emotion was put into the songs either. As a former fan of the Backstreet Boys, I had hoped that Nick Carter and Jordan Knight would try to push the envelope and experiment more with their music style but it seems with Nick & Knight, that the two are sticking to what they know. Their album definitely gives off that boy band feel with its upbeat songs and falsetto style of singing, which leaves listeners disappointed. As veterans of the music industry, it was almost expected that Nick and Jordan would put their talents together to create new and updated pop music but it feels like I’m listening to one of New Kidz on the Block or Backstreet Boys old albums. They didn’t seem to put all of their creative talents together when making this collaboration. Aside from that, there is not much difference in the composition of each song, making it feel like you’re listening to the same song over and over again. Every track on the album features both artists and the same poppy beat dubbed with their voices over it. Aside from the different lyrics and introduction into the songs, every track listing sounds exactly the same and as former Pop stars, Nick and Jordan could have done much better. The best part of the entire album was the last track, “Halfway There”, because it was a little different from the other nine songs on the album, which are all basically identical in tune and melody. However, “ Halfway There” is a good change of pace since the beat slows down and it is not an upbeat song but rather a nice slow song with a soothing melody. To showcase both their talents, Nick and Jordan, should have recorded songs that scaled in tempo range and had a different beat than the others so listeners could get a feel for everything they have to offer. Another major issue with Nick & Knight is the old school elements they brought to the album, which didn’t match with the new sound they were trying to produce. The entire album is all electronically done, meaning there was no band or anyone playing instruments for the songs but rather a man at a computer making the beats which also diminishes Nick and Jordan’s creative abilities. It would have been a nice add in if at least some of the songs included guitar riffs or possibly even a piano melody but the closest we get to that is a synthesizer which is so outdated that it doesn’t fit with their new music. The synthesizer clearly does not belong in this album just as the stereotypical fading out at the end of the song. Nick and Jordan use the fading out method to come to the end of their song but that tactic hasn’t been seen since the 1990’s, where it should stay. Even worse is the very prominent auto tune that was used to shape their voices in the album and one really awkward talking part in the song, “ Paper”. I’m not sure if they were trying to add something new to their album by trying to rap or just speak the lyrics but the small part of the song where Nick is speaking rather than singing was uncomfortable and should have been cut out. Other artists, such as Anthony Kiedis from the Red Hot Chili Peppers, often use this speaking over singing style when recording but Nick and Jordan’s version was just too altered to be taken seriously. The producers made the mistake in slowing his voice down, lowering the tone, and adding trance music during this part in “Paper” and should have used less auto-tune to produce an overall better sound for this. Even if the tempo of this part were taken up a couple notches, it would have made all the difference. Not just the beginning of Track 8 was overly altered but the entire album was noticeably touched up with the help of auto tune when Mass Appeal and BMG, their producers, should have let Nick and Jordan’s natural voices shine more.